Unit is loaded via forklift at floor level. Unit rotates 180°, docking pour hood mounted slide gate to a stationary hopper fill hood at 70” above floor level. 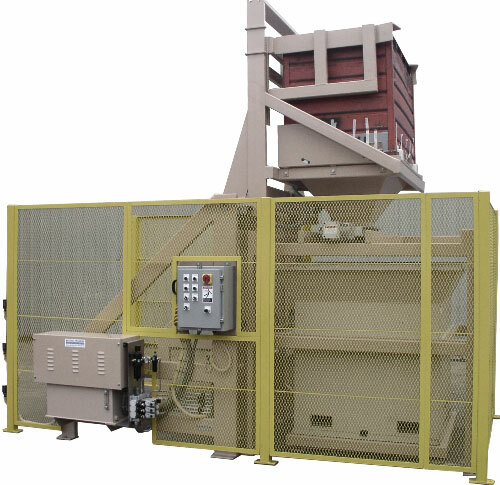 Fill station includes a pneumatic lift table to lift and dock the receiving hopper to the hopper fill hood. Safety features include three (3) sides of flattened expanded machine guarding, three (3) photo-electric sensors on the load side of the unit, and a Zero-Force touch button requiring the operator to have both hands in use to operate the unit. Allen-Bradley zero force two-hand safety touch button. NEMA 4 carbon steel Hoffman brand electrical enclosure.